Me and purplerose decided to revive EOW and make it more regular. We're going to switch during next few topics until chaosrocks is back. Ark could be classic ship as well as spaceship or even cargo plane. I want to see it resting at the end of it's long journey just few moments after it finished (for example during uploading) or many centuries later crashed and abandoned or just resting calmly in one piece. Make wide overview or view from the board as you wish. Design of an ark is important but not most important. It should be rather a part of environment not a design itself - it should be linked to landscape and consist a part of it. 1. Ark or it's remains. little extension of deadline should help everybody to back on EOW. Next EOW's will be more regular and last a week. Last edited by Manuel_Calavera; August 13th, 2007 at 03:02 PM. That's a really nice topic. Can you feel the freshness?Well I do. As to making this look like LucasArts environment from games such as Indiana Jones or Monkey Island I think this is also a great idea that will allow few interesting tricks but will also bring it's limitations- the neccesity of showing everything clearly at a certain set angle so you can imagine a sprite character walking up and down your environment picking things up and opening doors. I have a few ideas for this one... can't wait to see everyone's images! here's my final, i think. Indiana Smith and the Last Resting Place of the Ark. Crazed biotech engineer and CEO, Noah Vanderbilt, built the Ark out of military surplus to transport genetic materials from all of earth's animal life to his secret arctic base, where he schemed to bring about World War III and the end of civilization. He didn't count on the intervention of an intrepid naturalist named Indiana Smith. Last edited by Basil; August 14th, 2007 at 05:19 PM. I like the 1st and the last one. The first seems like an actual "resting place" for a dead ship or something and the last one seems to be more fused with an unforgiven landscape. Those two seem more linked to the environment to me than the 2nd one that looks like it was just placed there. This is an awesome topic. I really like this one! Amazing topic . I will get cracking with this over the weekend. quite interesting quickies - number 1 and 3 is worth to continue. Notspecialist- I appreciate it. Good point, i'll definitely add more rubble to the nose part of the ship. I really like your quickies, nice mood in all of them. I think the 3rd one works the best IMO, it's has a more interesting layout. i don't feel like i'm getting the scale that is intended for something like this though. what do you think? Try dropping your horizon line much lower(especialy on image 1 and 2) . approximatly 1/5 from the bottom, that will make the ark look much bigger in scale, also add some creatures around the ark also for that masive perspective you want. On the 3rd image pull your perspective right back, high above, maybe even show a cloud plane from above, and also you can creat some small landscape around it, imaging the ark as a city, and you need to paint the land around, that should give you effects you need. hope this makes sence, and if you get it right you could even make it possible to turn a mouse into a giant. try doing very small thumb nail sketches to see what i mean. This is what i did today.I don't have much experience with environment, so any critic will be appreciated. I was thinking to add some space ships here and there. Nice turn out Dave. I think you should make your canvas a bit bigger that way you can add a little more environment around the arc. Umm, besides that I think maybe you can increase your depth by darkening your shadows a bit. Can't wait to see the end result. good ideas here people, some really nice ideas. I have one question though, to everyone, becouse it seems to be something that everyones done. All your Arks seem to be damaged in some way, was that before or after the discovery of land. Becouse if its before, then wouldn't the Ark have sunk and drowned all the animals inside? DaveClarke: Nice one! 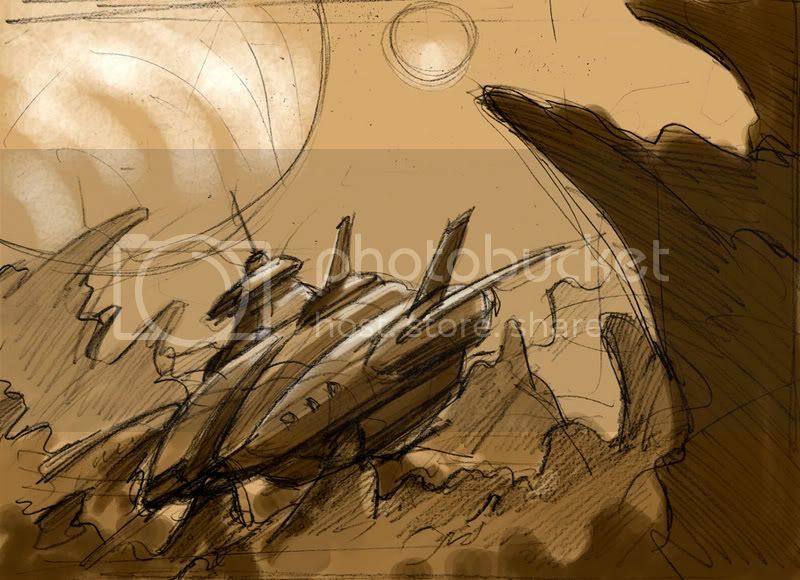 I don't think you should add spaceships, it might turn into a clich&#233;. And I think the composition is great as it is now, don't reveal too much. out from it. the existing and the new enviroments should be pretty contrasty. so im thinking of using colour for this. DaveClarke: Nice one! I don't think you should add spaceships, it might turn into a cliché. And I think the composition is great as it is now, don't reveal too much. I've change couple of things. Simonstalenhag: Yes i know it is a cliche, but it is my first environment so "what a hell". moniteur - That is a really nice concept, showing that life has sprung from what the Arc was originally carrying. I can't wait to see a finished version of that! great scott you guys are good. i'm going to try to get into this, it'll be my first environ piece, and i know it's something i REALLY need to work on. the biggest problem i seem to be running into is that everything I come up with is almost a blatant rip off of DaveClarke's WIP. lol i'll think of something. here goes nothing!!! welcome to the boards mon, i'm liking that sketch. the rest of you are looking good too, now let's get some more entries. i just updated my post at the top. Last edited by Basil; August 13th, 2007 at 07:31 PM. Hi all ! Glad to discover this nice forum ! I don't think I'm in for this time (I am not good enough to take part, but will go into the sketches&WIP ): but I do appreciate the challenge ! 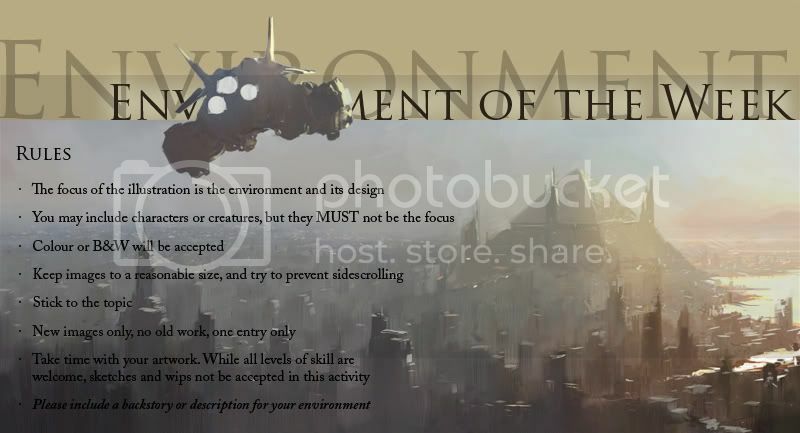 With this in mind, does it mean that the environment, like a background in the point&click thing, should be only static (without flying object, animals coming in...)? This will be my final entry. Next time i will put more effort. Thanks for c&c. Did anybody else notice that "Arc" is spelled wrong? Nice topic by the way, I wasn't even meaning to enter this or any at the moment, but an idea just screamed at me, so I have to I guess. LOL thats what was bugging me about the title. ARK. Noah's Arc is not as exciting. My Entry is on its way. Last edited by Gaius; August 13th, 2007 at 01:57 PM.